So what’s it like getting services and stuff at a marina? Venetian Hire Boats & Chandlery (a.k.a. Aunty Wainwright’s)… – The Diesel-Electric Elephant Company. Well, it’s a much more lively process than getting services at one of CaRT’s (remaining) service areas, although both have their place in the (in my) grand scheme of things. Venetian Hire Boats & Chandlery is a business I would like to draw your attention to in this matter – for all of the right reasons. The Cardinal and I appear on their threshold when we can, rather like very slightly adventurous but perennially bad pennies. I use them as an example of commercial services because they don’t throw rocks at me, and so I could grab a few photographs. Venetian Hire Boats & Chandlery live on the Middlewich Branch of the Shropshire Union canal. 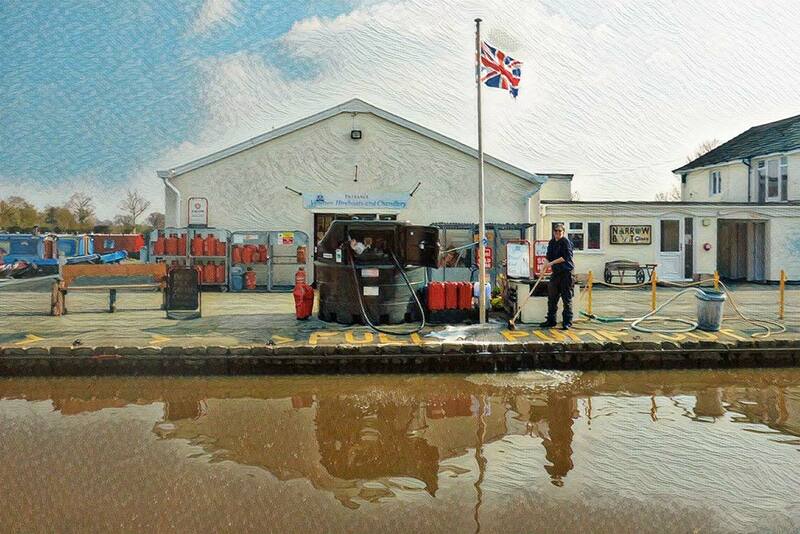 Under new management, the hire boats are squeaky new, the chandlery refurbished, re-organised and re-stocked. Even the website is fresh. Venetian Hire Boats & Chandlery website here. They stock just about everything a narrowboater needs to keep on keeping on, from gas and wood and coal and diesel to spares and oil and paints and ropes and even poop-scoops and combs and beers and wines and manifold groceries of a comestible nature. For the purposes of life on a narrowboat it is akin to pulling up at a super-omni-service station. Moor in the right spot between the lines and I can empty the gazunders, fill the main tank with water, guzzle some nice red diesel into the fuel tank, throw a couple of bags of coal and kindling onto the well deck, restore my inner child with an orange popsicle and replenish the Cardinal’s food baskets with stuff ranging from Ginger Biscuits to pasta and HP Sauce and the makings of …yes, curry. A typical visit would involve all of those things. Brick-dwellers would need to make several trips by car to achieve what I can achieve just by pootling the Cardinal along to Venetian. Time it just right and Aunty Wainwright Sue will like as not cop hold of the centre-line as you approach and help secure the boat too. You don’t get that sort of service from your average supermarket, petrol station or utility supplier. The Cardinal’s main water tank is 545 litres and can take some time to fill so it’s one of the first processes to set in motion. While the hosepipe is gurgling away in there I will empty the gazunders (Thunderbirds 1 to 4) and be certain to leave myself time to wash (and wash and wash and wash) my hands like some borderline neurotic (borderline? really?) before I finish off the watering process, and before I trundle around the shop and wotnot. Gas? Swap out the bottles in the gas locker at the bow – a heavy job and a bit awkward to manoeuvre the bottles in and out and disconnect or reconnect, but nothing like removing your own appendix on the slopes of K2. I have direct and easy access to the bow gas-locker on the Cardinal, so there’s no need like some to lean out from dry land towards the pointy bit with a 13kg bottle in one hand and a spanner in the other. I bung the bottles on the well-deck first and then move everything forward – I had the cratch cover designed so that I could do that. Coal? 20kg or 25kg bags, over the gunwales and onto either the well-deck or in the Cardinal’s case, usually, into the coal “cellar” inside, out of sight. In the depths of winter it is possible, without undue disconvenience, to stock five sacks of coal in the indoor cellar and a further five on the well-deck, plus the necessary kindling and an enamelled bucket for ashes. Sneakily, the car park at Venetian is an address known to the supermarkets for deliveries of more major comestibles – I can meet the Tesco’s or Sainsbury’s or Fortnum & Mason’s van there and all that is then required is to trolley my truffles and foie gras and crates of Chateau Margaux Puissance Wogga-Wogga ’53 to the boat, and occasionally up or down a tad of towpath. It’s all terribly civilised and if you time the visit properly to avoid hire-boat change-over day and/or summer rushes then there’s no queue and it’s all done in “canal time”. In a pinch all of that could be done in twenty minutes. Generally though, I have no idea what time has elapsed and, if there’s no queue, no-one cares to check. Once in while, if I haven’t seen or spoken to another human bean for several years, I’ll yack and blather on so long that I begin to hear gunshots (as people indicate that while it’s been lovely for me to meet them, they really mustn’t let me delay them any longer). The hire boat portion of the business? Well, I have seen many hire boats float by – even hired one myself, briefly, Inland Waterways Helmsman qualification for the purposes of – and there are currently two companies that I would recommend. One is Messrs Cheshire Cat Narrowboat Hodilays (upon which I will happily report more at a later date, the they of the Helmsman course) and the other is Venetian Hire Boats – this bunch. Venetian have a very select fleet of some of the poshest boats I’ve seen around, and all sporting quite the most eye-catching livery. Should you ever decide to try out life on the ocean canal waves yourself for a holiday then cast your beadies over their website. They maintain two larger boats for week and fortnight type cruises, and have a brand-brand-brand-spanking new baby boat for day hire or for weekending. Some hire boat companies will just throw the ignition keys at holiday-makers and consider their job to be done. Venetian get you aboard, literally show you the ropes – and cruise you up and down the canal a bit so that you can try out mooring and turning and threading through bridge-holes. Only when you too can boat on rice-paper and leave no trace are you allowed to leave the monastery, Grasshopper. Um – well, when they’re happy that you’re happy, then you get to cruise away into the sunset. I know this because I have watched them do so… Generally, if I am moored nearby and they pass with a fresh batch of holidaymakers I’ll open the Cardinal’s side hatches, shake a fist and shout at them to get off my private canal. I like to give the holidaymakers the right impression from the outset, and view myself as the welcome wagon. ‘Slow down, where’s the fire?’ ‘Look out – you’ve lost your water-skier…’ ‘Oh great, there goes the neighbourhood…’ ‘I’ve been boating for nigh-on six hundred years, and I’ve never before seen such as…’ ‘Who taught you to helm a boat? Boudicca in her chariot?’ ‘Don’t panic, but there are a couple of really, really ugly trolls sitting on your well-deck, you can’t see them from where you are but that’s why people on the towpath are screaming…’ and other, welcoming quips that I offer with a Hector smile. Part of my planning for the Cardinal’s glacial mooching about is to ensure that, as far as is humanly possible, I find myself in the vicinity of businesses like this one (in the vicinity of the few that I will give repeat business to) on a regular enough basis to keep the gas bottles healthy, coal supplies throughout winter, water once a fortnight or so, gazunders as and when necessary, comestibles when the fancy takes me. If you want to move around the canals without finding yourself short of a tin of Heinz Baked Beanz or with no water in the tank there is a complicated formula to be solved – location versus oomph to move all over facilities available divided by keeping the Canal Company happy – squared by the weather and then square-rooted by doing whatever the hell I feel like doing when I feel like doing it. There’s work involved but then there is also that feeling to be had of cruising away with all that ought to be empty being empty, all that ought to be full being full, and thus a couple of weeks’ of delicious sod-it-and-what-the-hell mooring to be had before the next need for bunkering. Most canal towns and wotnots have some sort of marina, hire and/or chandlery business but, as I mentioned, only such as these do I visit twice. Part of my declining to be a further part of the insanity of the world was to get away from overgrown corporations as much as possible, and it is thus much nicer being able to do business with family-owned concerns. The less money I fork over to International Bat McFastard PLC and the more that I can direct to local, canal-based businesses the better. Whatever you have to spend, chaps, do please spend it locally. Chin-chin for the mo, Muskies. Ian H & Cardinal W.
Loved this tour around your Chandlery and just for a while felt I was in an alternative dimension, so very very welcomed thank you!